The Interboro band brings together adults and young adults from the community to play beautiful music. It’s open to anyone grades 9 through adult who can play high school level music. The band will meet for its 26th season on Mondays, beginning September 18th. Are you nostalgic for the days when you played in your high school and/or college concert band? Remember the joy of making music with like-minded players (but without the pressure)? If so, how about dusting off your instrument and joining the Interboro Community Band! Many ICB members started out quite “rusty” but were amazed at how quickly their skills returned once rehearsals began. 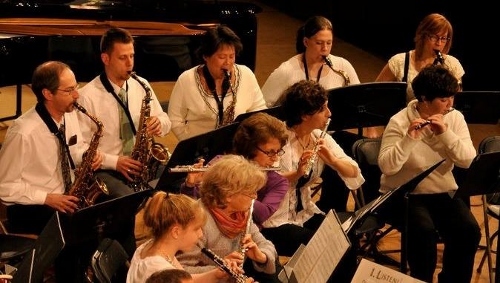 We are a welcoming and fun ensemble that meets on Monday nights, September through June, from 7:45-9:15 pm in the band room of Algonquin Regional High School in Northborough, MA. The band is under the direction of Matt Lefebvre and plays a variety of pieces from marches and musicals to some fairly challenging compositions for symphonic band. Although the band is made up largely of adults of all ages, membership is also open to students (grade 9 and above), who are able to play at a high school level. (Oboe, Clarinet and French Horn players are especially welcome.) If you’re not sure of your level, come and sit-in on any rehearsal!